One of the sharpest attorneys in Charleston, S.C., Sally Baynard isn't your typical southern belle. She's certainly not what her mother hoped she'd grow up to be, especially since she divorced her husband, Family Court Judge Joe Baynard, and his historic family with their historic wealth and historic houses. Maybe Sally was never going to be a proper society lady, but her success as a public defender and family lawyer have been enough for her. She's represented murderers, burglars, drug dealers and lately has taken on some of the thorniest divorces, all cases closed with her Sally Bright Baynard wit, charm and brains. Or have they? One case she's never successfully closed is her marriage. 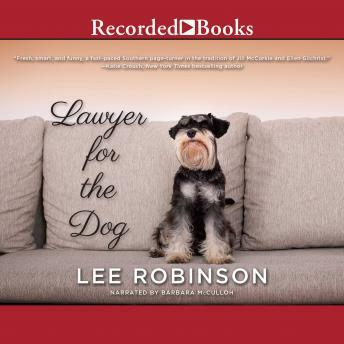 And when Judge Joe assigns her to one of his divorce cases by appointing her as the Lawyer for the Dog -- Sherman, a miniature schnauzer-- she's forced into close quarters with him again. Juggling the needs of the dog, the angry owners, her amorous but uncommunicative ex-husband, her aging, Alzheimer's-ridden mother, and the expectations of the court is more than Sally could have imagined. And as rascally Sherman digs his way into Sally's heart, he brings along his charming vet Tony, a man who makes Sally question her views on love and marriage.